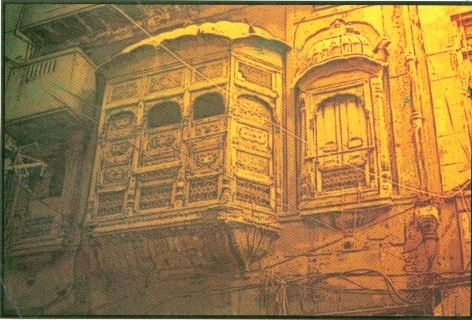 "Balcony" from old area of Lahore city. Here’s a new miniature I made. It is a single figured composition. Representing a Mughal princess, special place and care is given to the jewelry and the dressing. 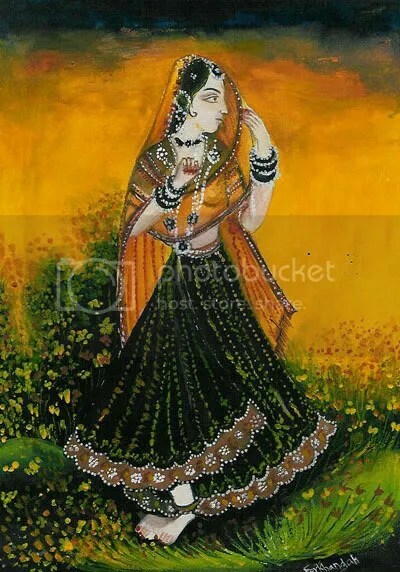 It is painted according to the traditional mughal style. Sharp and contrasting colours are prefered to make it more eye catching that is black, yellow, green and orange are most prominent of all. Please leave a comment if you’d like to have this painting. In this post I’ll introduce a few miniatures I made recently. If you like them or if you are interested in these miniatures please leave a comment. The miniature of an old musician: this miniature shows a musician in a somber mood. 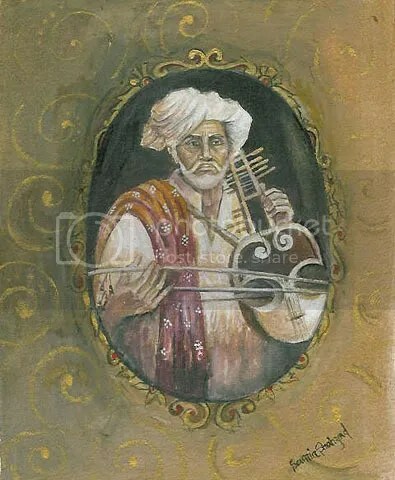 It shows a Balochi figure (from Balochistan province of Pakistan) holding a musical instrument. it is a realistic modern miniature. I have tried to depict Balochi cultural side in Pakistan. Old man is holding an instrument called Surando.The name of instrument, Surando is based on ” Surayindah” a Persian word for one who produced.It was used by their natives and is still practiced. The “Shawl” is an another object added to render the typical dressing of Balochi people. eye catching .i.e. black,yellow,green and orange are most prominent of all. Here are some of the paintings I made. In the second half of the 16th century, India witnessed the introduction of Mughal paintings. Mughal painting was evolved around the influences of mannerisms of Persian paintings and paintings of Western Indian School , Sultanate School , Central Asian School , Kashmiri, Tibetan, Nepali and European elements were mixed up. Thus was born Mughal miniature during the ruling period of emperor Akbar. Of the Mughal paintings in this section, mention may be made of displayed illustrations of Hamzanama painted on cloth, the Exodus of Moses, two illustrations of a manuscript entitled Iyar-e-Danish in which notable painters in the atelier of Akbar did superb paintings. These paintings were done with judicious .combination of colour, shadings and compositions. The pomp and grandeur of the Mughal court have been reflected through these illustrations. The period of Emperor Jahangir (1605-1627 A.D.) marked a notable change in the tone and temper of Mvghal miniatures. The paintings evinced a sense of delicacy, a subdued colour scheme and a fascination for portraying animals and birds of rare types. Of the paintings of this period in this section, mention may be made of the painting entitled ‘The Hermitage of Shaikh Phool by Bishandas presented in the gallery. The paintings in the period of Shah Jahan (1628-1658 A.D.) evince the pomp and grandeur of Mughal court. The Museum has a number of notable paintings of this period. 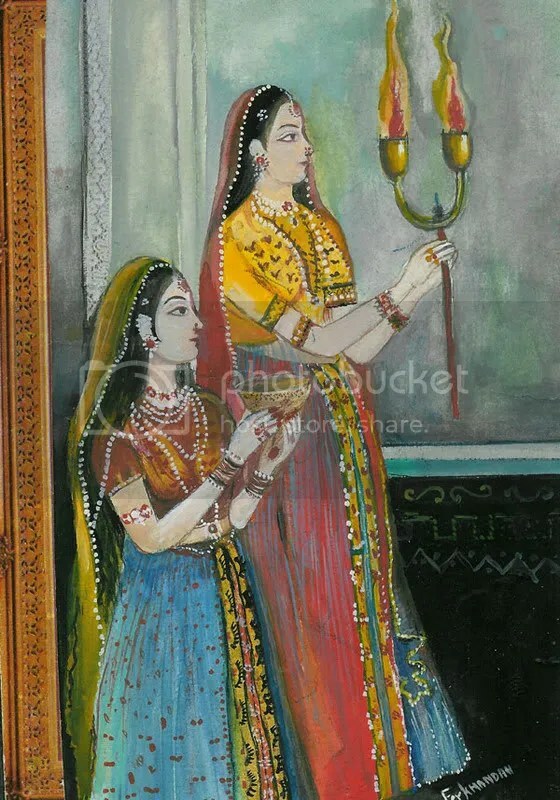 These include the portrait of Shah-Jahan, The Treaty of Quandahar, Shah Jahan in Court (displayed) Lady Painter in Zenana (displayed) Bharatiya Sundari (displayed) Mughal damsel, etc. Of these paintings some are historically important while others are artistically pleasing. Nowadays in hundreds of arts institutions miniature is practiced by the students. This phenomenon could also be observed at art galleries and we can see many artisans in the past and even today working in this field in several countries. People do it some times because they are interested in it few for commercial reasons and also some people consider it as a original practice of art. This miniature showing two figures are representing mughal art characteristics to some extent. Holding objects mostly which were present in the periods of mughal dynasty. Colors are also mughal in nature. Bright and fresh . One lady is shown with a bowl in her hand and other one next to her with a glowing flame in her hand. The original procedure of painting a mughal miniature is a bit different from the respective miniature . Because in mughal miniatures designs and motives are painted with a complete perfection. It seems as if it is printed or it is machine made not hand made. But the recent painting is painted in an abstract manner. Designs though belongs to the miniature motives but are uneven and deformed. They are abstract. So in other words it is called “Modern” miniature. Which is highly appreciated and favored by the art lovers today. The jewelry , dressing with the ornamentation,figures and the features depicts the typical mughal style.